Received 28 July 2011; revised 30 August 2011; accepted 15 September 2011.
were analysed in both time and space domains. and models both parametric and non-parametric. both earthquakes is clustered and concentrated. the epicentre of the main shock. 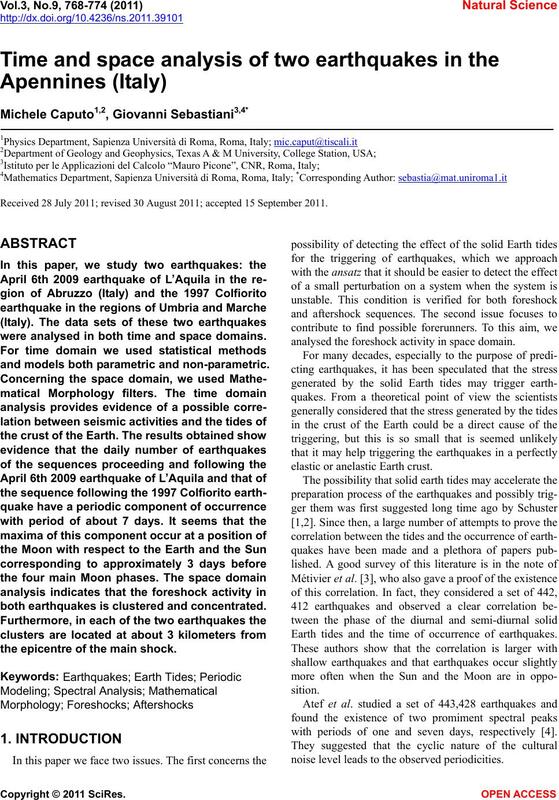 analysed the foreshock activity in space domain. elastic or anelastic Earth crust. 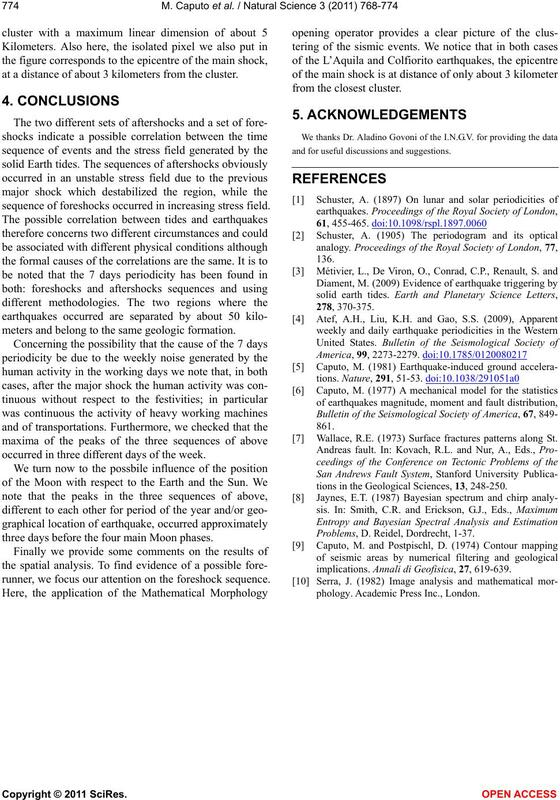 Earth tides and the time of occurrence of earthquakes. with periods of one and seven days, respectively . 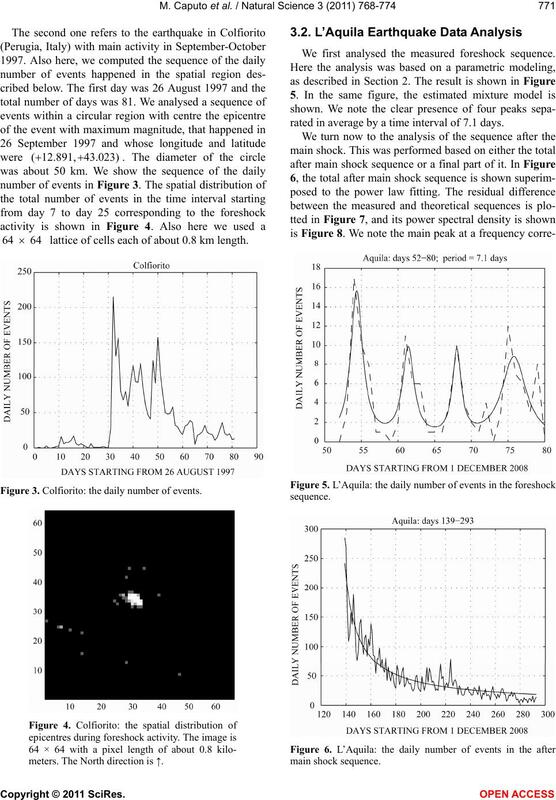 noise level leads to the observed periodicities. the regions of Umbria and Marche (Italy). are 5000 times more numerous than those with area A .
mizing the sum of squared errors. Our focus here is to study the distribution of epicentres. Among the many different approaches available (see e.g. nates isolated cells qualified 1 or small clusters of them. tuto Nazionale Geofisica e Vulcanologia (I.N.G.V.). vely. The diameter of the three circles was about 33 km. each of about 0.8 km length. Figure 1. L’Aquila: the daily number of events. 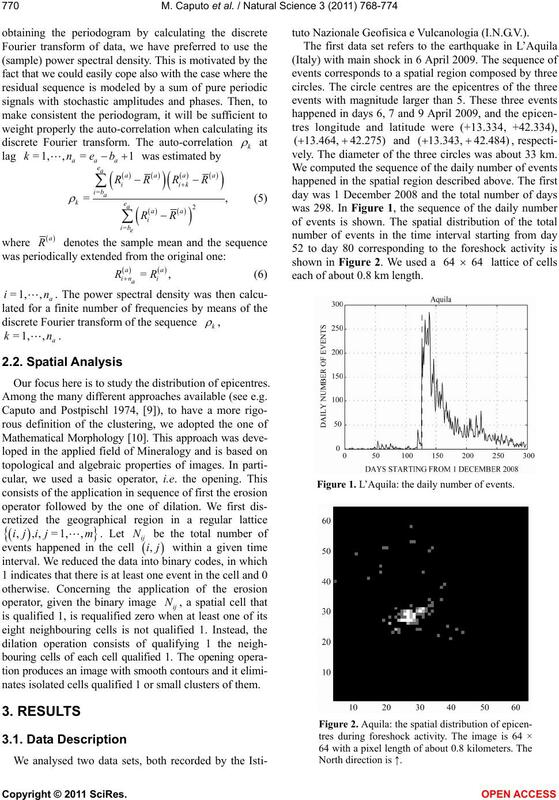 64 64 lattice of cells each of about 0.8 km length. Figure 3. Colfiorito: the daily number of events. meters. The North direction is ↑. 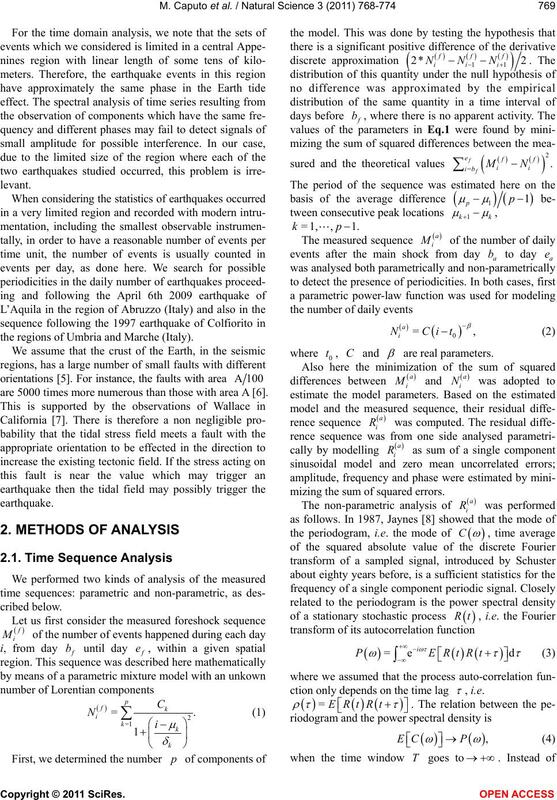 We first analysed the measured foreshock sequence. rated in average by a time interval of 7.1 days. daily number of events in the after main shock sequence. applied to a final part of the after main shock sequence. length of 49 days, which a multiple of seven. final part of the after main shock sequence. about 0.8 kilometers. The North direction is ↑. is about 3 kilometers from the closest cluster. days, which again is a multiple of seven. at a distance of about 3 kilometers from the cluster. 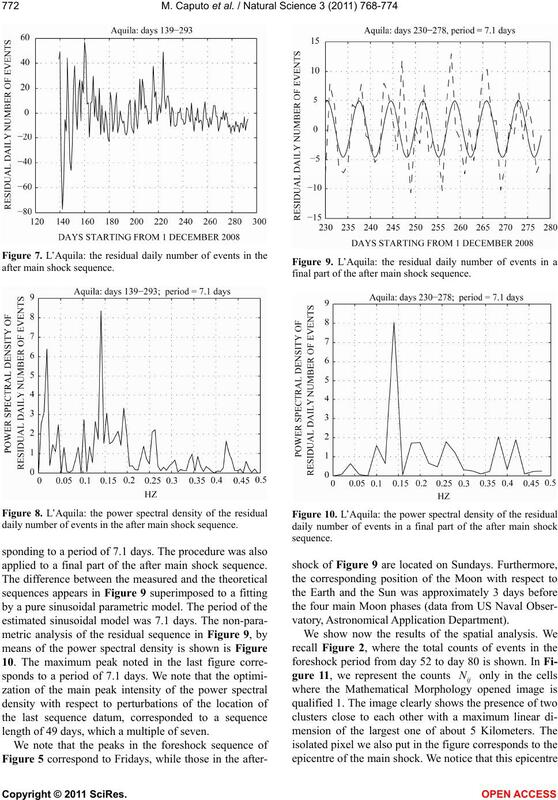 sequence of foreshocks occurred in increasing stress field. meters and belong to the same geologic formation. occurred in three different days of the week. three days before the four main Moon phases. 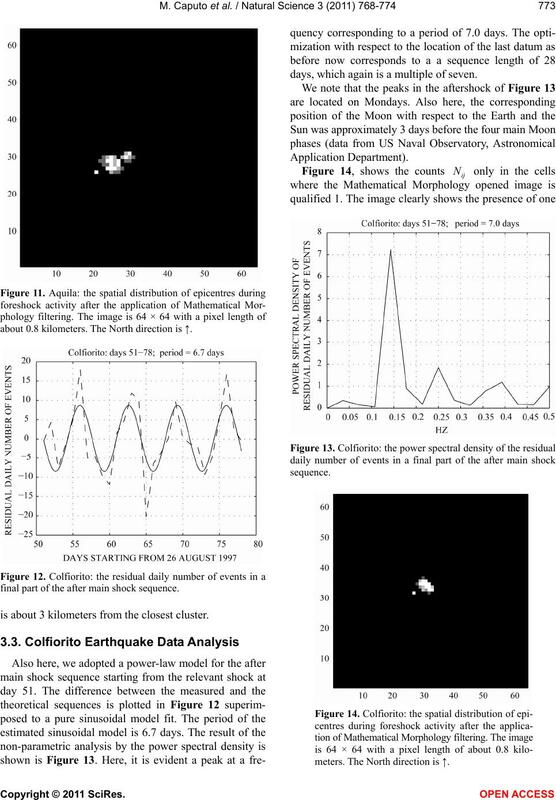 runner, we focus our attention on the foreshock sequence. and for useful discussions and suggestions. Wallace, R.E. (1973) Surface fractures patterns along St.
tions in the Geological Sciences, 13, 248-250. Problems, D. Reidel, Dordrecht, 1-37.
implications. Annali di Geofisica, 27, 619-639.
phology. Academic Press Inc., London.